The Governor's Economic Development Conference, April 15, Sioux Falls. BIO International Convention, June 15-18, Philadelphia. South Dakota Manufacturing Week, Sept. 28-Oct. 2, statewide. "Young Adults: Then and Now." Explore how the people aged 18 to 34 have changed over the last four decades. South Dakota is partnering with South Dakota EPSCoR to sponsor IT Academy. A new Career & Technical Education Program will be housed from a South Dakota Certified Ready Site. With the holiday season behind us, now is the perfect time to reflect on the accomplishments of our past year. And there were many. From in-state companies expanding, to relocations to South Dakota, to job growth, to capital investment - we have a lot to be proud of. The GOED's 2014 Annual Report is in the works, but I'd like to give you a sneak peek. Consumers Supply announced the construction of a new, state-of-the-art facility in North Sioux City. The plant will produce bagged, pelleted, or texturized feeds, and vitamin premixes, creating nearly 20 jobs. Award-winning technology company Sterling Computers announced that the company is relocating its corporate headquarters from Norfolk, Neb., to Dakota Dunes. The expansion includes a new 20,000-square-foot building and a minimum of 10 full-time jobs. 3M announced a $57.6 million expansion in Brookings that includes a 44,000 square-foot addition and 60 new jobs at the medical products facility. This project is on the heels of a 2013 expansion that resulted in a $11.7 million capital investment. Fargo-based Discovery Benefits, a third-party benefits administration and claims management firm, announced an expansion into Brookings, which will result in 20-30 initial hires, and up to 125 new jobs over the next year. Ag Growth International (AGI) announced a new, 120,000 square-foot, Hi Roller production facility in Sioux Falls. The facility will house all production and office personnel. The GOED, along with representatives from Aberdeen, Black Hills Power of Rapid City, Britton/Glacial Lakes Area Development, Huron, Madison, Pierre, Sturgis, Vermillion and Yankton are headed to the Shooting, Hunting, and Outdoor Trade (SHOT) Show in Las Vegas later this month. 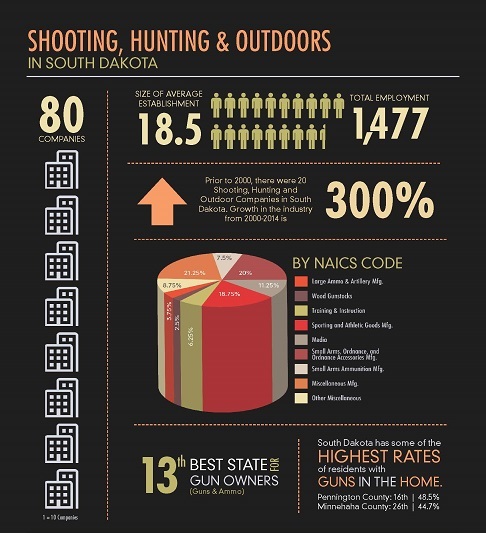 The infographic at right illustrates key facts about the Shooting Hunting and Outdoor industry in South Dakota. The SHOT Show attracts businesses from all 50 states and more than 100 countries, and is the largest show of its kind.